According to the latest figures on consumer prices released by the Statistical Institute of Belize, the prices of goods and services regularly purchased by Belizean households were 2.2 percent higher on average during the month of April 2017 than they were in April of 2016. The All-Items consumer price index stood at 105.3 for the month, an increase from 102.9 during the same period last year (See Figure 1). For the first four months of the year 2017, a year-to-date inflation rate of 1.9 percent was recorded. International airfares were up significantly in comparison to April of 2016, as the steep upward trend observed over the past few months continued into April 2017. As such, rising airfare prices were one of the primary contributors to a sharp overall increase of 17.9 percent in the Transport category (see Figure 1). Prices within the ‘Fuels and Lubricants’ sub-category were also up, increasing by 11.5 percent for the month in comparison to April 2016. The highest increase was seen in the price per gallon of Premium Gasoline, which rose by 31 percent from $8.29 in April of last year to $10.86 in April 2017. Diesel was also up considerably by 25 percent from $7.34 to $9.19, while Regular Fuel rose by almost 14 percent from $8.68 in April 2016 to $9.89 in April 2017 (see Table 1). The ‘Food and Non-Alcoholic Beverages’ category recorded an overall decrease of 1.7 percent (see Figure 1), a decline attributable solely to falling prices among certain food items. These included beef steak, chicken breast, milks, eggs, onions, cabbages, and watermelons. The lowered prices for these products offset smaller increases in the prices of items such as ground beef and sweet peppers (see Table 1). The ‘Housing, Water, Electricity, Gas and Other Fuels’ category saw an overall rise of 1 percent, due to higher prices for Liquefied Petroleum Gas (LPG) and home rentals in comparison to April of last year. The average cost of a 100 pound cylinder of LPG rose by $13 or almost 16 percent from $83.76 in April 2016 to $97.03 in April 2017, while home rental prices were 0.5 percent higher than they were in the same month of last year (see Table 1). April 2017: Belize’s total imports for the month of April 2017 were valued at $146.7 million. This was a decrease of 10.4 percent or $17.1 million from imports for April 2016, which totaled $163.8 million. Decreased imports across most categories, including ‘Machinery and Transport Equipment’, ‘Manufactured goods’, and ‘Other Manufactures’ overshadowed purchases of ‘Mineral Fuels and Lubricants’ and goods destined to the Commercial Free Zones, resulting in the sharp drop in imports for the month. The significant decline of $24 million in imports of ‘Machinery and Transport Equipment’, from $53 million in April 2016 to $29 million in April 2017, was the primary cause of the downturn in overall imports during the month. Within this category, purchases of telecommunication parts alone plummeted from $17 million during April of last year to just over $0.6 million in April of this year. Imports of ‘Manufactured Goods’ saw a less drastic decline of $2 million from $21 million to $19 million due to lowered imports of glass bottles, plywood and aluminum windows and doors. ‘Other Manufactures’ also fell by close to $2 million from $14 million to $12 million, as a result of reduced purchases of floor mats, medical needles and catheters, and gold jewelry. Additionally, goods meant for the ‘Export Processing Zones’ dropped by $1 million during the month, from $5 million to $4 million, with milling tools, lift detectors and gaming machines being among the decreased items within this category. Imports of ‘Mineral Fuels and Lubricants’, on the other hand, recorded growth of nearly $7 million, as that category went up from $16 million in April 2016 to $23 million in April 2017, owing in large part to higher world market prices for fuel. A spike in imports of tennis shoes, women’s clothing and cigarettes resulted in an almost $4 million increase in items destined for the ‘Commercial Free Zones’, from $15.5 million to $19.5 million, while purchases of ‘Crude Materials’, particularly pine lumber, rose by over $1 million for the month. FIRST FOUR MONTHS OF THE YEAR:Merchandise imports for the period January to April 2017 totaled $578.3 million, representing a 4.9 percent or a $29.8 million decrease from $608.2 million over the same four-month period last year. The chief cause of the decline during this period was a $41 million drop in imports of ‘Machinery and Transport Equipment’ from $160.5 million in 2016 to $119.5 million in 2017, due to considerable reductions in purchases of telecommunication parts, four cylinder vehicles and telecommunications equipment. On the other hand, the ‘Mineral Fuels and Lubricants’ category grew substantially by $24.7 million from $52.5 million to $77.2 million, due for the most part to the continued rise in world market prices for fuel. 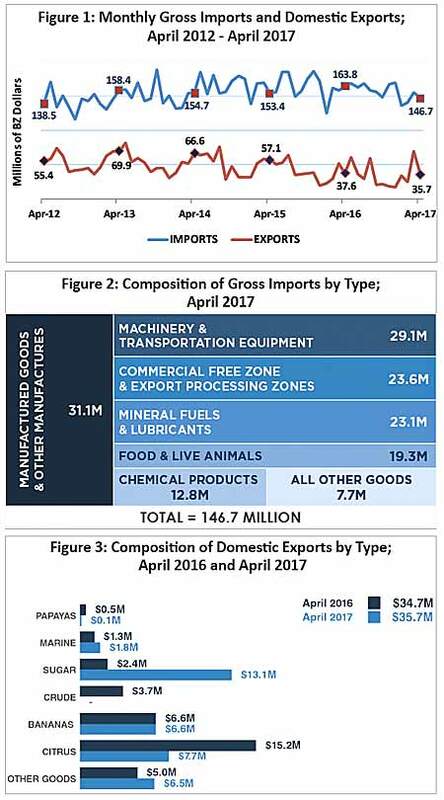 April 2017: Total domestic exports for April 2017 amounted to $35.7 million, up 3 percent or $1 million when compared to exports for April 2016. Sugar was the only major export commodity which saw a sizeable increase during the month, while both citrus and crude petroleum declined considerably. Sugar, the principal contributor to the increase in domestic exports during the month, rose from $2.4 million in April 2016 to $13.1 million in April 2017. Although no shrimp was exported in April 2017, marine products still recorded modest growth of $0.5 million from $1.3 million to $1.8 million during the month, owing to the strong performance in sales of both whole fish and lobster meat. Earnings from banana exports remained unchanged at $6.6 million, while citrus exports experienced a sharp decline, from $15.2 million in April 2016 to $7.7 million in April 2017, as sales of orange concentrate fell by almost a half during the month. There were no exports of crude petroleum during April 2017. The European Union accounted for almost two thirds, or $22 million of total exports for the month. Another 20 percent, or $7.2 million was exported to the United States (see Figure 4). FIRST FOUR MONTHS OF THE YEAR:Merchandise exports for the first four months of 2017 totaled $165.8 million, up $27.1 million from $138.7 million during the same period last year. Sugar continues to be Belize’s top export earner, accounting for approximately a third of total exports for the period January to April 2017. Sales of this commodity totaled $57 million, up by $23 million or 69 percent from the $34 million recorded for the same four-month period in 2016. Banana earnings rose by $8 million, from $22 million to $30 million, over the period. Crude petroleum exports, benefiting from more favorable world market prices, grew substantially from $7 million to $11 million, notwithstanding the fact that the volumes exported were virtually unchanged from the same period in 2016. Marine products, also contributed to the increase in export revenues during the period, as earnings rose by $2.7 million from $10.6 million to more than $13 million. In contrast, citrus exports shrank by almost $15 million from $38.4 million in 2016 to $23.5 million in 2017, due to a sizeable drop in sales of orange concentrate.